From left to right: LCT-1415, probably LCT-1179, LCT-1265, LCT-1049 are landing supplies on Yellow Beach near the mouth of the Bishi Gawa (River) while LSM-220 and LST-1000 are maneuvering behind them. Note 55-gallon drum dump ashore and vehicles unloading. The fleet is out to sea beyond the coral reef that prevented cargo and assault ships from getting in any closer. LCVPs (Higgins Boats) and other craft carry supplies to the beaches while the LCTs, LSMs and LSTs could land right on the beach at high tide after seabees enlarged the beach exit. Landing Craft Tanks (LCTs) were built in two versions, the Mark 5 (LCTs 1-500) and Mark 6 (LCTs 500-up). LCT-1415 was delivered November 2, 1944, ten days after her keel was laid at Pidgeon-Thomas Iron Company in Memphis, Tennessee. LCT-1179 was delivered June 28, 1944, thirteen days after her keel was laid at Bison Shipbuilding in Buffalo, New York. LCT-1465 was delivered on September 20, 1944, two months after her keel was laid on July 22 at Quincy Barge Builders, Quincy Illinois. LCT-1049 was delivered April 19, 1944, 15 days after her keel was laid at Bison. At Okinawa LCT-1049 was attached to LCT Flotilla 34; the other LCTs in the photo were attached to LCT Flotilla 21 Group 63. Landing Ship Tank LST-1000, commissioned June 14, 1944 under US Naval Reserve Lieutenant Wesson S. Hertrais, supplied the Normandy beaches as part of HXS-30, arriving at Avonmouth, England on July 25, 1944. She departed New York City for Pearl Harbor on November 29, 1944 to join the Okinawa operation. Landing Ship Medium LSM-220 was commissioned on August 20, 1944, US Naval Reserve Lieutenant John Van Wie Zaugg in command. LSMs could carry five M3/M5 Stuart light tanks, six LVT "alligators," nine DUKW amphibious trucks ("Ducks") or three M4 Sherman medium tanks or 500 tons of other cargo and mounted one 40mm and four 20mm cannon when launched. On April 1, 1945, L-Day for Okinawa, LSM-220 grounded on the reef on Blue Beach twice attempting to land tanks; both times the water was too deep. LSM-220 finally delivered her tanks to Yellow Beach 2. Pontoon causeways out to the reef were built and natural sandbars enlarged so that unloading operations could continue at low tide and LCTs could unload on the beach. 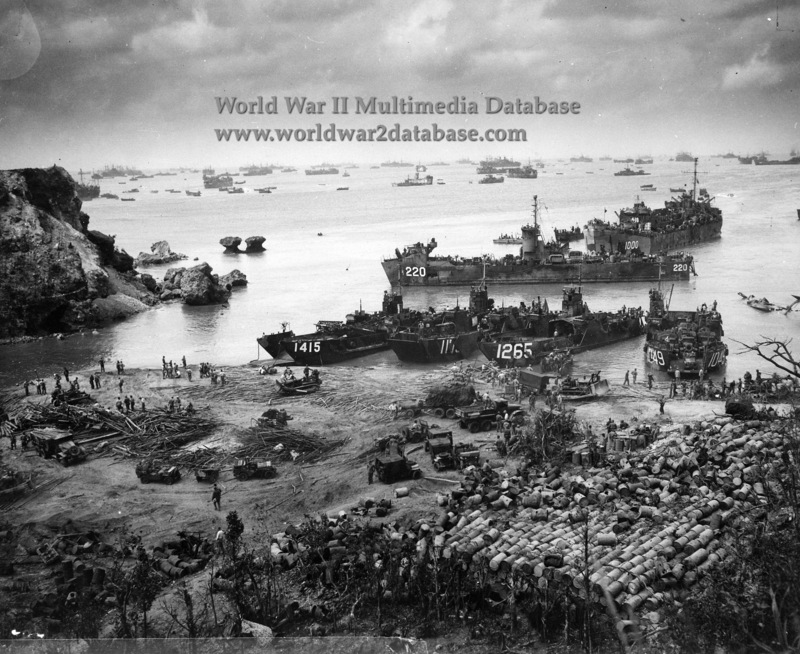 Despite the deep water and lack of suitable grounding space, eventually more cargo was unloaded at the Hagushi beaches in a shorter period of time than any other Pacific amphibious invasion. The LCTs and the LST in the photo were scrapped after the war; LSM-220 served as a commercial transport, supplying NASA's operations in Florida, until she was sunk in storm off the Bahamas in 1970.